Welcome to iDANCEFLOORS, the perfect place to hire your dance floor! iDanceﬂoors is one of the UK’s leading hire companies supplying a range of the best portable starlight dance ﬂoors, black & white dance ﬂoors, LED funky disco dance ﬂoors, star cloths, starlit/starlight LED twinkly tables, and enhanced lighting to the wedding and events industry. Whether you want wedding letters, a MR and MRS sign, illuminated numbers or LOVE lights, our giant letters are perfect for adding a touch of sparkle and glamour to any special occasion. 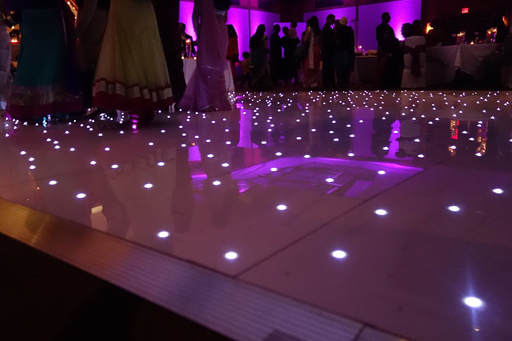 Our colour LED twinkling white dance floor is perfect to add that extra bit of class to your wedding or event. They can be set to either a normal white theme, a choice of colours. Black Starlit dance floors have become the ultimate ‘must have’ accessory for weddings and events. The Dance floor is a beautiful black gloss finish with thousands of individual twinkling lights embedded within the floor.